With my "Sabbath and Youth Ministry" class (taught by Nate Stucky), I have covenanted to receive the Sabbath each week this semester and to reflect on it each week. I may not have planned it this way myself, but Henry decided that he wanted to be born on our Sabbath. At 3am, Amanda’s water broke... getting things started early. From there on, our Sabbath was all but Sabbath... indeed it was a very laborious day (pun intended). Amanda labored at home for a few hours, while I tried my best to help her through it and time her contractions, before we finally went to the hospital. Her labor progressed more rapidly than usual. By the time we reached the hospital, she was already fully dilated and ready to push. An hour later, at 2:48pm, Henry was born. We got to spend the rest of our day as a family for the first time... even if our family time was repeatedly interrupted by nurse visits and routine medical procedures. While the day was anything but restful, I’m not sure it wasn’t in some way a Sabbath for us. Sabbath has been seen by many, not least Barth and Moltmann, as a foretaste of God’s future with God’s people and God’s creation. Sabbath, as such, is deeply eschatological. And while I’m sure the connection might seem crass to some, the birth of Henry was, to me, profoundly eschatological. The wait was over. And even though there was so much to be done even after his birth (including circumcision... poor guy) and even though we were all but rested, there was a different kind of rest enveloped in the event. What we’d been waiting for had finally met us... and we met him. The work was finished. Sabbath is the celebration of finished work. Not our work, of course, but God’s finished work. We rest on Sabbath because, while so much of it is yet to be realized or implemented, the work of salvation is finished. Indeed, because God “has future as [God’s] essential nature” (Moltmann, Theology of Hope, 16), it can be said that salvation has been true from “before the beginning of time” (2 Timothy 1:9). Therefore, the grace of Sabbath rest, the celebration of finished work, preceded us before we even got started. When in time we apprehend with our experience the finished work, when we experience God’s future (i.e. grace) even under the conditions of existence (“The state of existence is the state of estrangement.” Tillich, Systematic Theology, Vol.2, 44), we can experience Sabbath rest even in the midst of relative chaos. Even in the midst of the chaos of Henry’s first day of life, relishing the presence of that for which we’d waited with such anticipation, we rested together as a family. 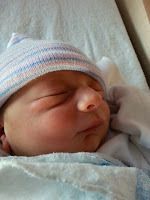 And incidentally, Henry’s first full day of existence was a day of rest and celebration.